Air conditioning systems don’t last forever, no matter how well you take care of them. Replacing your air conditioner during the fall or winter is not such a big deal, though it may be a bit of an inconvenience. Having to replace it during the summer, with record heat turning the inside of your home into a sauna, is quite a bit more uncomfortable. For that reason, it’s important that you be able to identify when your system is getting close to the end of its life. Better to replace your air conditioner earlier in the summer than to have to scramble to replace it when it breaks down later on. The following are some of the more obvious signs that you need to install a new air conditioner. Over years of use, the air conditioner accumulates more and more wear on the various parts of the system. This will eventually start to cause the system to lose efficiency, forcing it to operate for longer to maintain a proper temperature. This will drive up the cost of using the system on a monthly basis. If your air conditioner is costing more to use than you feel it should, you might want to have a technician examine it to make sure it’s still functioning properly. If the system is simply worn down, then the only way to resolve the issue is to install a new one. Air conditioners break down from time to time, just like most things. If you need to repair your system every few years, it’s no big deal. If you need to repair your system every few months, though, then you should probably consult with a professional about installing a new one. 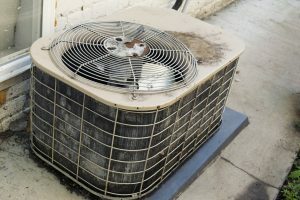 If your air conditioner is breaking down that often, it likely means that the wear and tear on the various parts of the system is causing them to fail in groups. If you continue to use the system when it’s having this issue, you run the risk of having it break down completely in the near future. The average lifespan for an air conditioner is 10-15 years. Once it passes the age of 15, it will often start to develop chronic issues like those listed above. The older the system gets, the more issues it will collect, until it becomes quite expensive to use it at all. If your air conditioner is older than 15, we recommend that you talk to a professional about installing a new system. Better to install a new system now than to risk your current one failing on you in the near future. You’ll save much more money in the long run, anyway. Douglas Cooling & Heating offers AC replacement services of all kinds in Birmingham, AL. If you need a new air conditioner installed in your home, contact us today schedule an appointment with one of our professional technicians. We’ll find the best air conditioning solution for your needs.